I like that they go around states. It shows what other Aussies eat. This book is about two posems,One of the posems, (the little one) terned invisible so they both set of to hell her. I HOPE YOU INJOI IT! Two little possums go on an adventure. This book is great for kindergarten to year 2! This book is a classic. No matter you age, you will still love it. A great book for generations of readers. An Australian Classic! This a great Australian book. This book is great because it gives lots of information about Australian food and places in Australia. I would recommend this book to young children. This book is a classic. 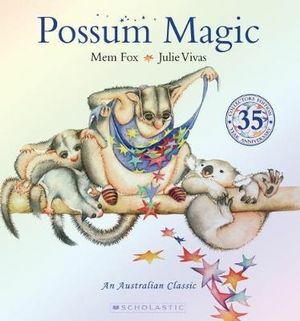 This is a classic book from Mem Fox. It is best suitable for 0-8 year olds or for adults to read to their children. so good for for 0-7. one of old time favourite you should read it. This book will take younger children on an Australian magical adventure. I would recommend this book to 0-6 year olds. A magical Australian book with good illustrations all about healthy food (and some treats too)! I like that hush wasn't invisible anymore because he ate Australian food.